At Davam Urgent Care, we offer urgent care for kids in The Woodlands, Texas. When your child is suffering from a non-life-threatening medical condition and your primary care physician is not available, there’s no need to deal with the long wait times and high costs of a freestanding emergency room. At our state-of-the-art facility, we accept most insurance plans, and offer affordable pricing for self-pay patients. Each child is treated by a board-certified medical provider. Treatment for illnesses and injuries – We can provide top-quality care for children who have most minor to moderate conditions. 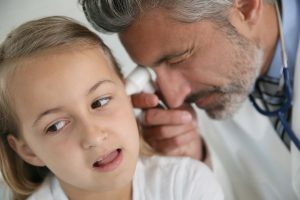 This includes conditions such as a bone fracture, a laceration, a fever, or an ear infection. Diagnostic services – We provide in-house lab tests, X-rays, EKGs, and more. This helps to expedite your child’s diagnosis so he or she can begin treatment as quickly as possible. General medical services – We can provide school and sports physicals in addition to other basic medical services to protect your child’s health. Our comprehensive care isn’t the only reason that families choose us over the competition. Davam Urgent Care is also committed to the convenience of our patients, which is why our office is open daily from 8 a.m. to 9 p.m. We also never require appointments, so your child can receive care from an experienced provider whenever the need arises. Walk-ins are always welcome at Davam Urgent Care. When it comes to urgent care for kids, Davam Urgent Care is the premier provider in The Woodlands, TX. If you’re planning to visit us today, sign in for your appointment now using our online check-in system, which may reduce or eliminate your wait time.